I finished the dress with three days to spare and all went well at the wedding. 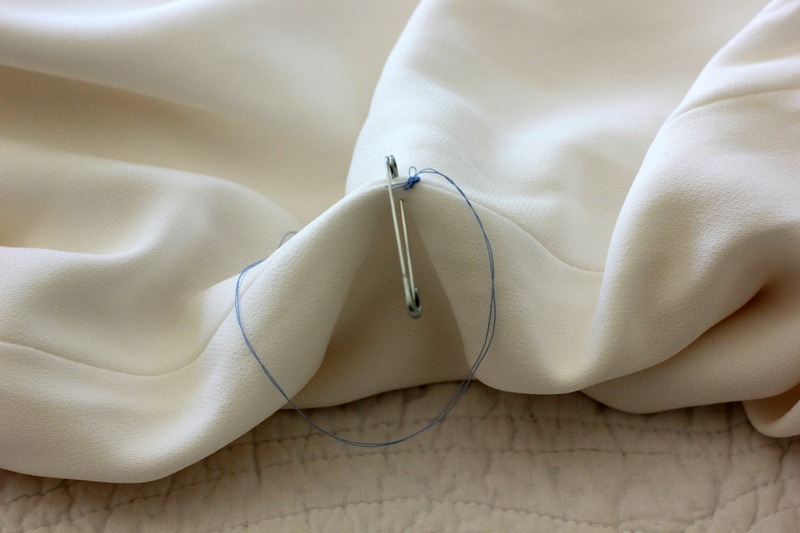 I had packed my needle and thread just to make sure I could remedy any mishaps that might occur at the wedding, but it was smooth sailing! One couldn’t have asked for a more beautiful setting for a reception either, in the groom’s home overlooking a cliff on the Santa Barbara coastline. So lovely! I felt so anxious about ruining this dress or spilling something on it that I actually had a nightmare that the day before the wedding the dress had mysteriously turned brown and I had no idea why! I had to run around looking at bridal stores for a new dress and the stores all closed at five and it was already three! Four dogs who like to sneak into my sewing studio, four kids in and out, and a husband who loves to use his blower to blow away leaves right outside my window, and you can only imagine the fear I had for making this dress dirty. I continue this week with some of the tutorials and process posts that I’ve been documenting this summer. Today’s post is about how to make a French bustle or an underbustle on today’s very fitted and smooth skirts. 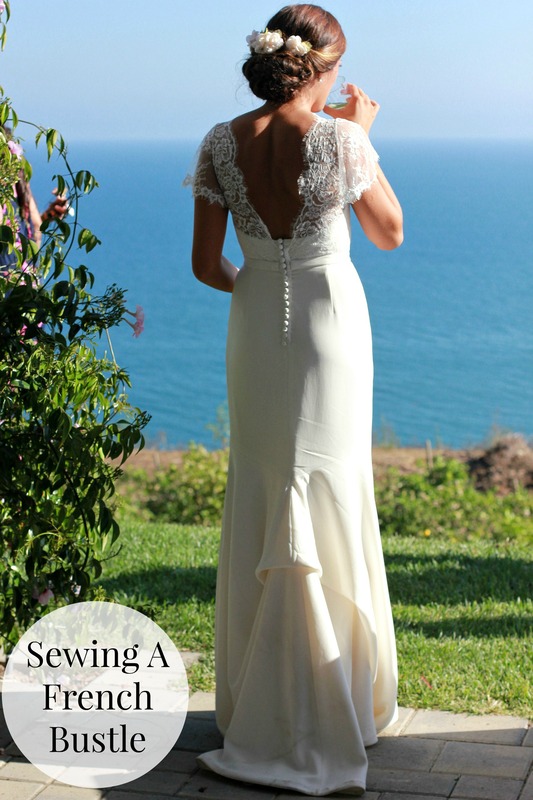 The bridal sewing books I have explain only how to sew an overbustle, with the rigging on the outside of the skirt, more appropriate for full skirts. But the new bridal styles, many of which are mermaid and trumpet styles, like these on the BHLDN site, need a different approach. Finished underbustle in my studio. Rosario having just tossed her bouquet to her single friends. 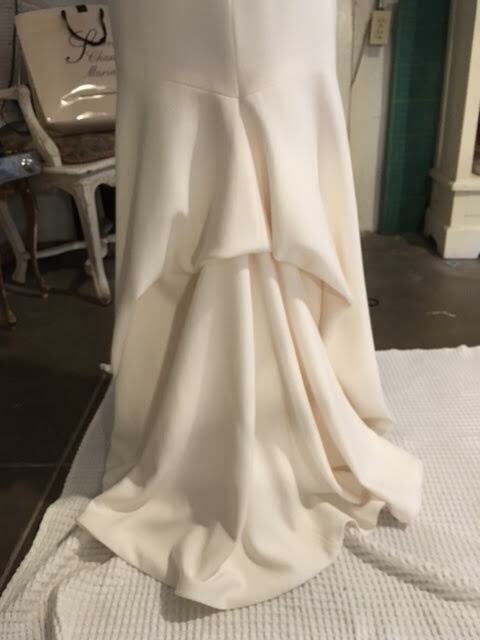 When Rosario asked me if I would take on her wedding dress refashion back in March, one of the things she needed me to do was to make a bustle for the fitted, semi mermaid style skirt. I had no idea how I was going to do it, as I’ve only made one other bustle, an overbustle for a lace skirt with the rigging hidden under a waist sash, but I said I would do it. You know I love a challenge! 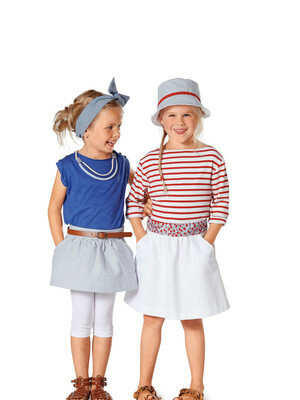 The skirt with the original top still attached. I thought about how I would go about it without any of the rigging being visible but couldn’t see it in my head. So I had her try the dress on while I draped the skirt in different ways. After some unsuccessful tries I came up with the right look….I pulled three spots on the skirt, one in the center and two lower on the center panels of the sides up to meet the side seams until they were just grazing the floor. I pinned them with safety pins. Looking back, I think I might have basted them with needle and thread as I had to steam out the holes from the pins and this fabric shows every little thing. I used two safety pins at each attachment spot so when it was taken off I could mark both spots. In the future, I might use fine dressmaker pins to do the draping until I find the perfect attachment spots on the skirt. Then I would hand baste the spots. I thought I ‘d come up with a new idea, but a search online of ‘underbustle’ revealed this technique is called a French bustle. Oh well! I then found a tutorial that uses ribbons and rings to attach the bustle from underneath, and another using ribbons and felt, but I decided to use hooks and eyes instead. It just seemed simpler and my skirt wasn’t very heavy. There are three pick up points that need to be attached to three points higher in the skirt at the side and center back seams. Once the pick up and attachment points were marked, I needed to sew in the hooks and eyes. 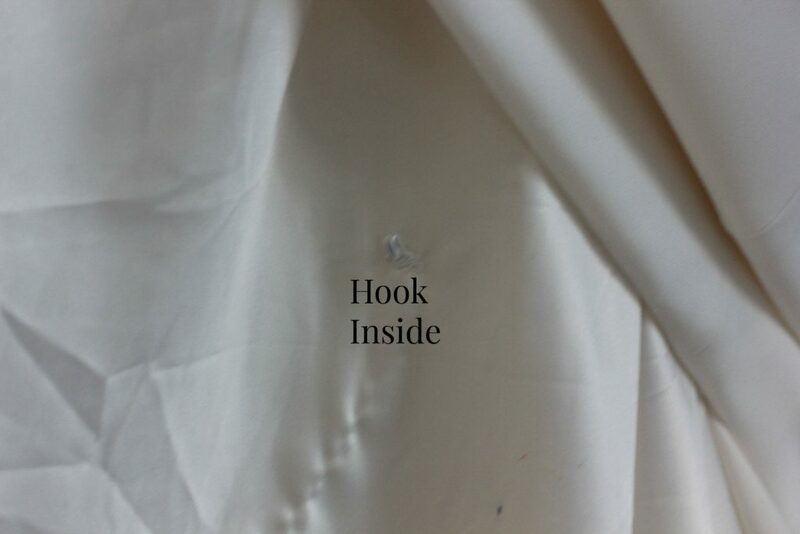 The hooks would be on the three lower pick up points and would need to be sewn in with the hook part pointing up so it could catch on the higher eyes which are sewn into the sides and center seam. I first sewed the hooks and eyes on while the skirt was lying flat on my big table but when I hung the dress up, I could see the points were I had sewn them were pinching and twisted looking. I wish I had taken a photo of the twisted look. This happened because I had sewed the top layer of the skirt to the underlining at slightly different points and they weren’t completely aligned together when I sewed on the hooks and eyes. It’s almost impossible to see that when the skirt is lying on a table. 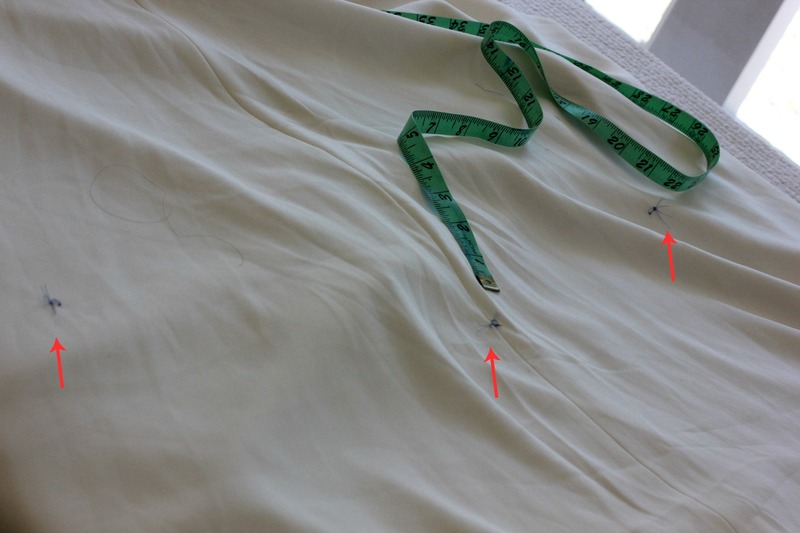 The top layer of skirt and underling need to be aligned perfectly on top of one another or they will get twisted looking at the spot where the hook or eye are sewn on. The best way I found to align the two layers was to hang the dress from the ceiling . 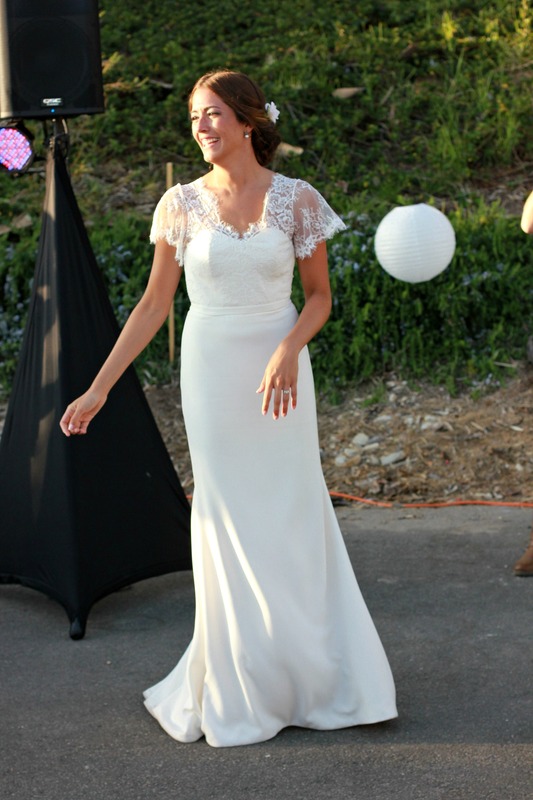 Or another way would be to make the bride stand in it or have it on the form while you sew it. So I resewed the hooks and eyes while the dress was hanging from the ceiling to make sure there would be no pulling or twisting in those spots where the hooks and eyes were sewn on. It really helped to have it hanging because I needed to make sure the the needle was poking through the side seam where it is almost invisible vs. just a little to the side where you can see the thread. So I needed to keep getting under the skirt and then look on the outside to make sure things looked good. Gah!!!! Sewing a Chantilly lace overlay A delicate subject a white linen smock from sewing for your girls-japanese pattern book in english Spring sewing inspirations: Sailor and French linen Links to over twenty in print bridal gown sewing patterns! What a lovely dress! 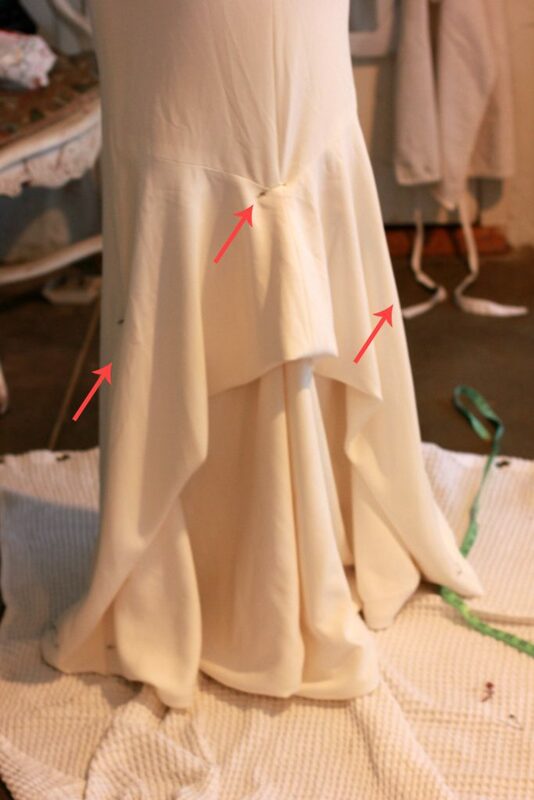 The refashion looks intrinsic to the original bridal skirt. What a talent! I still did not get the whole bustle tutorial, but, I may try a few things when I am making those little girl princess dresses I have planned. Thank you for the tutorial, Justtine. I hop you were not too nervous to actually enjoy thee wedding! It looked lovely. Awesome job Justine! 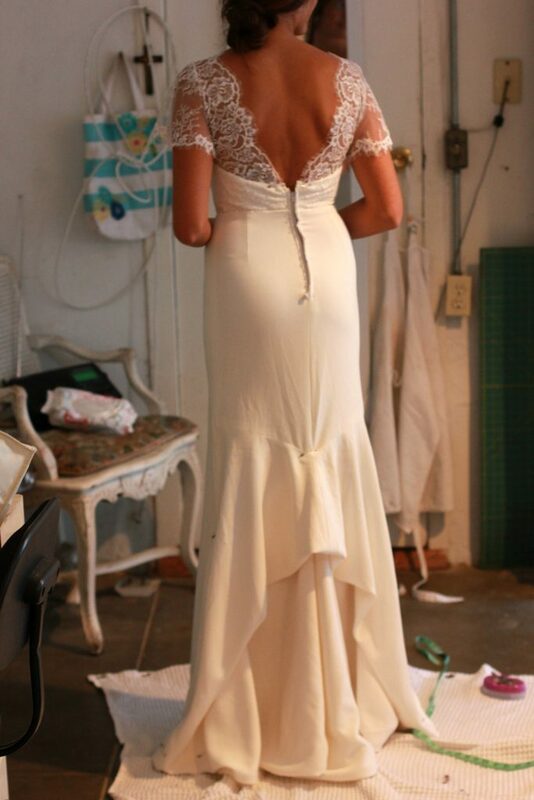 Beautiful dress and great work on your part. I think altering wedding dresses is so stressful. I can totally relate to the whole dream episode. My son is getting married in October, so my sister and I will be making some alterations on his bride’s wedding dress. She is only 5ft tall so shortening the dress, which will have to be done from the waist of course. And she would like a lace up in the back instead of a zipper. I would rather sew for my granddaughters (so much more fun), good thing I have my sister to help out. Congratulations again for a project well done. It is. I’d much rather make a dress from scratch than alter an existing one. 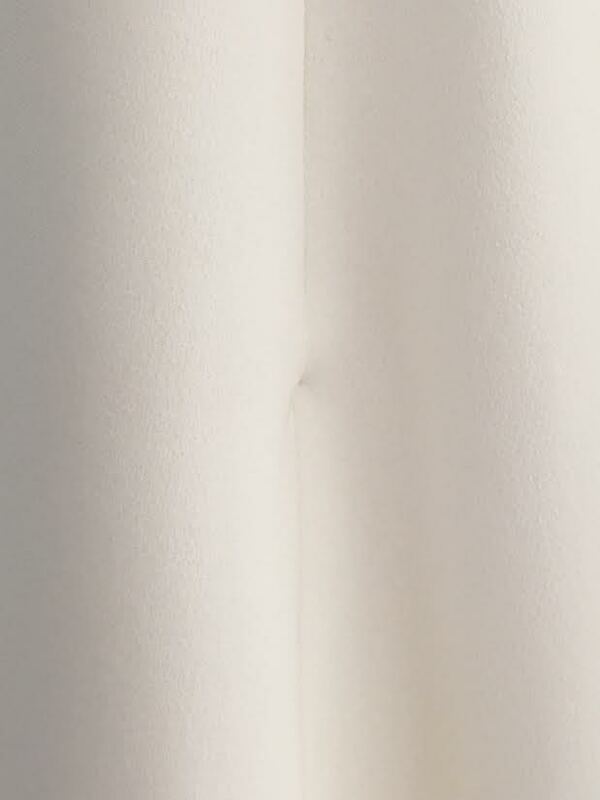 Your attention to detail on this dress is immepacle! Absolutely stunning! Only you could take a break from blogging then come back with a bridal refashion. Bridal work is the most heart rendering, nightmare inducing work. Also, so satisfying once finished! I’m majorly impressed.